No one knew what to expect when Batman: The Animated Series premiered on Fox during prime time in September of 1992. 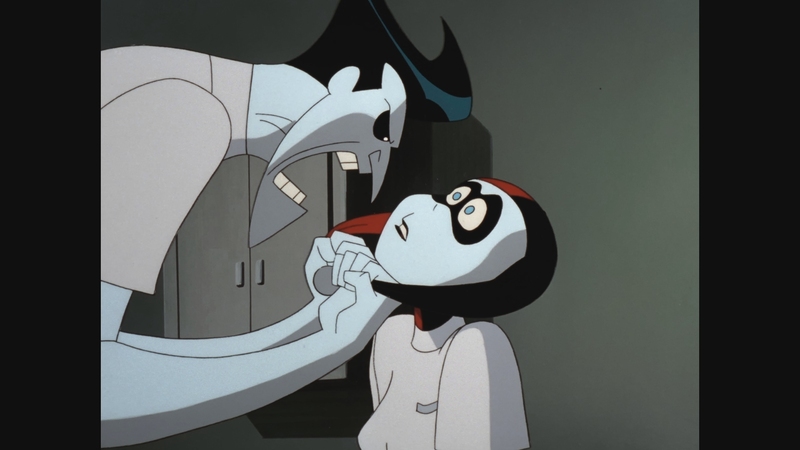 Supposedly aimed at older children and teenagers, producer Bruce Timm and his partners created the purest adaptation outside the comic book medium of the Dark Knight. The series was a revelation at the time and has only grown in stature over the years, practically changing the face of animated storytelling for superheroes. Coming on the heels of Tim Burton’s wildly successful Batman movie, its lasting impact is still felt today in multiple mediums. It is required viewing for any Batman fan and has left an indelible mark on the Caped Crusader. 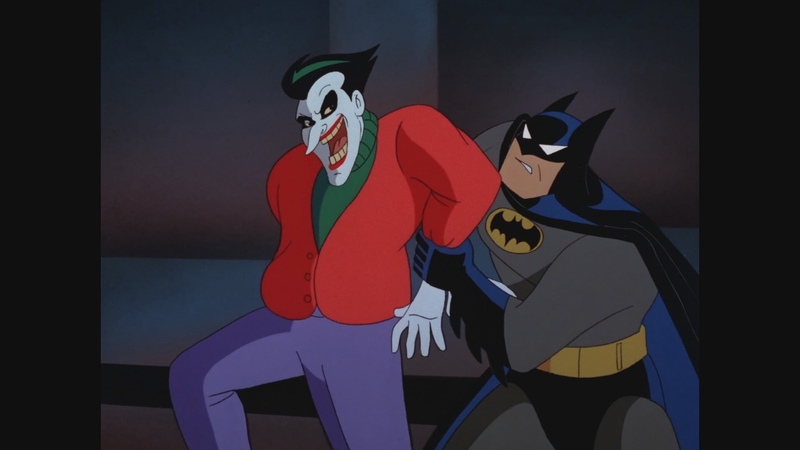 Batman: The Animated Series was not Super Friends with stiff animation and terrible scripts, hampered by severe creative limitations intended to protect young children. Employing darker and more adult story-lines, often adapting classic Batman comics aimed at older readers, its smooth storytelling redefined the character and his mythos for a new generation. The show became such a force that its influence spread beyond the confines of animated television aimed at children. Among other accomplishments, it created and introduced the popular Harley Quinn, now such a famous character that Warner is building a movie around her. Many fans consider voice actor Kevin Conroy ‘the’ voice of Batman, more than any of the actors that have played the character on film. Something like Batman: The Animated Series had never been attempted before, and certainly not with comic book superheroes. Set in a timeless Gotham littered by Art Deco designs, it featured Batman and his entire world of characters in a thoroughly noir-like setting. It is breathtakingly ambitious, taking creative chances with tweaks to familiar characters like the Joker. More importantly, the show deeply respected the source material and only deviated when smoothing out the roughest edges. 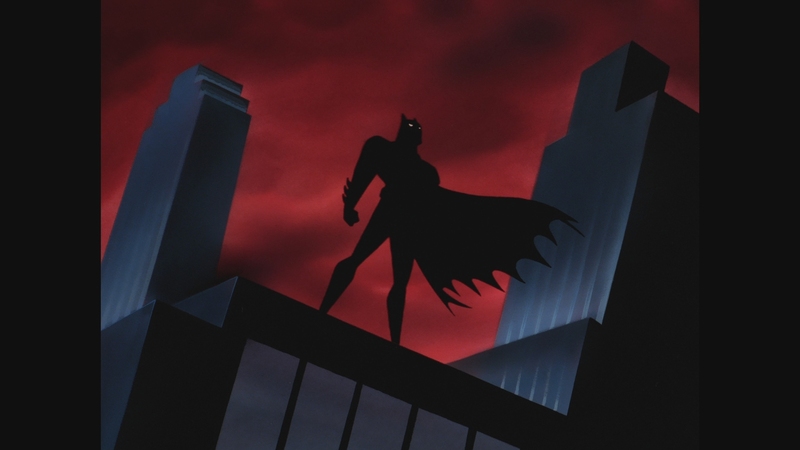 Employing Bruce Timm’s now-familiar and iconic character designs, the series was allowed to explore more of Batman’s world. The show had an uncanny knack at fundamentally understanding each Batman character, from deadly villains to his friends and allies. There was action and adventure tempered by a sense of realism and depth to the characters. It’s rare when art and commerce come together this nicely, producing one of animation’s crown jewels. 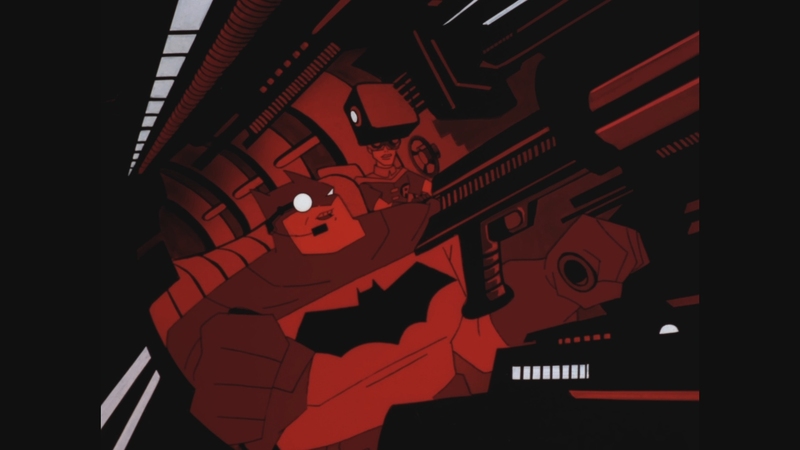 Bruce Timm’s visual storytelling and keen sense of mood make for an incredibly polished animated show that “gets” Batman better than all the blockbuster movies ever could. 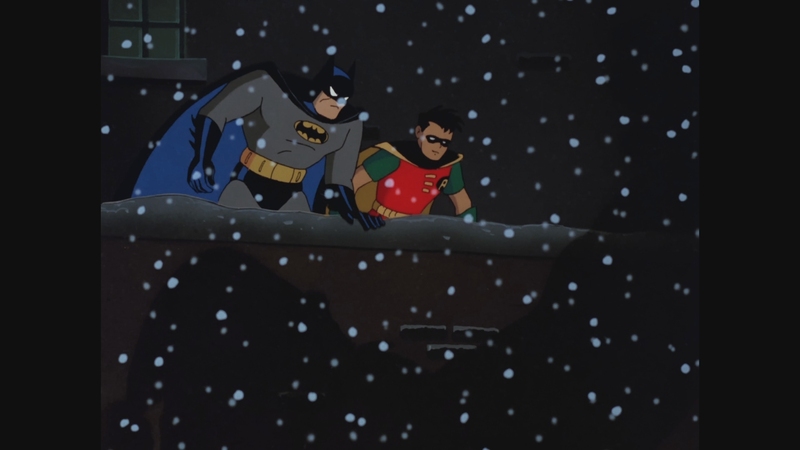 Freed to do almost any story-line by the unlimited potential afforded by animation, the series skillfully adapts some of Batman’s greatest comic book moments, cut down to twenty slick and economical minutes of story each episode. It delves into Bruce’s relationship with Alfred, Bruce’s early training before becoming Batman, Harvey Dent’s transformation from D.A. to villain, and so much more with sophistication and emotional resonance. Batman wouldn’t be half the character he is without his fearsome line-up of villains. The series has wonderful versions of Batman’s rogues gallery, including The Joker, Harley Quinn, The Penguin, Mr. Freeze, Poison Ivy, The Riddler, Two-Face, Ra’s Al Ghul, Scarecrow, Poison Ivy, Clayface, and Ventriloquist & Scarface. 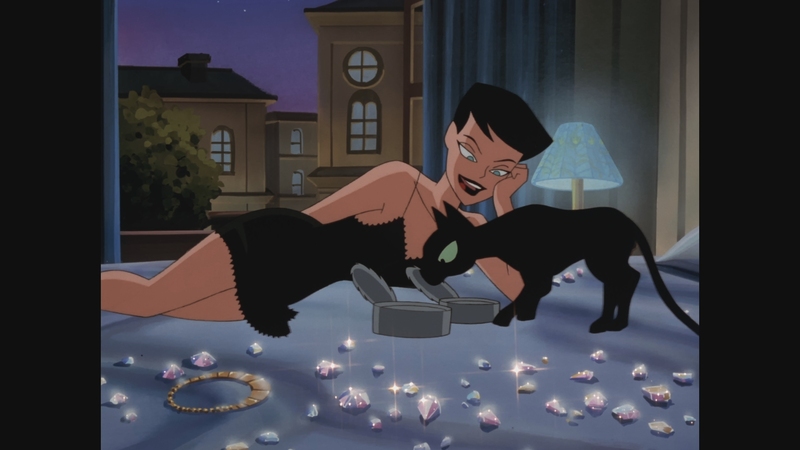 Batman: The Animated Series speaks for itself. It’s the greatest animated show ever made about a comic book character and remains an industry benchmark. Batman: The Animated Series surpasses all expectations on Blu-ray with a transfer from the original elements. Warner Brothers has done a solid job without messing up the cel animation with unnecessary processing. This is not what I would classify as revelatory picture quality. It is however a massive improvement over the existing DVDs and the best possible condition expected. The colors are more saturated, the black levels are deeper, the line work in the animation more visible. Never a show that was awash in color, everything pops with more dimension and clarity. What we get is a fine 1080p presentation of the entire series, with a few limitations in the original cel animation creeping into the video. 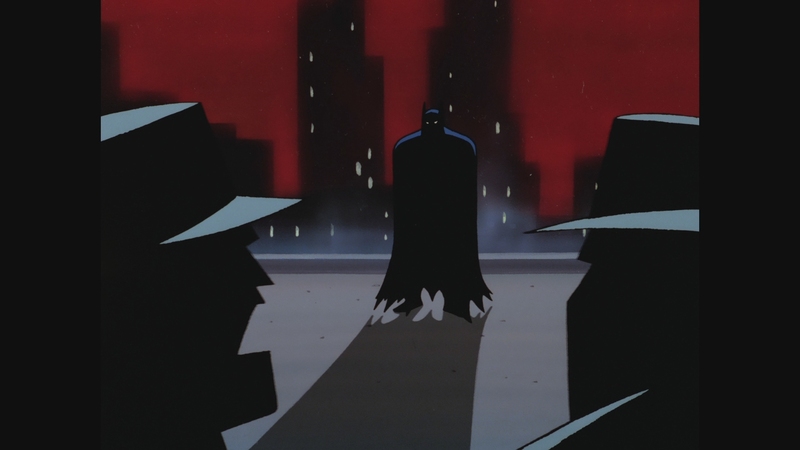 Produced in the early 1990s by a string of different animation shops in the Far East under the guidance of producer Bruce Timm and others, the strong character designs and film noir aesthetic produce one of the more memorable-looking animated superhero shows of all time. 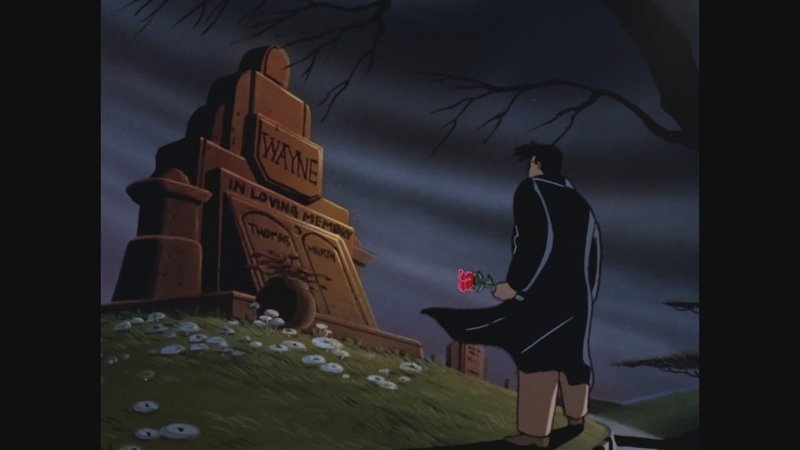 Timm’s popular character designs set the standard for animated superhero storytelling, influencing the next two decades of DC’s animated output on television. 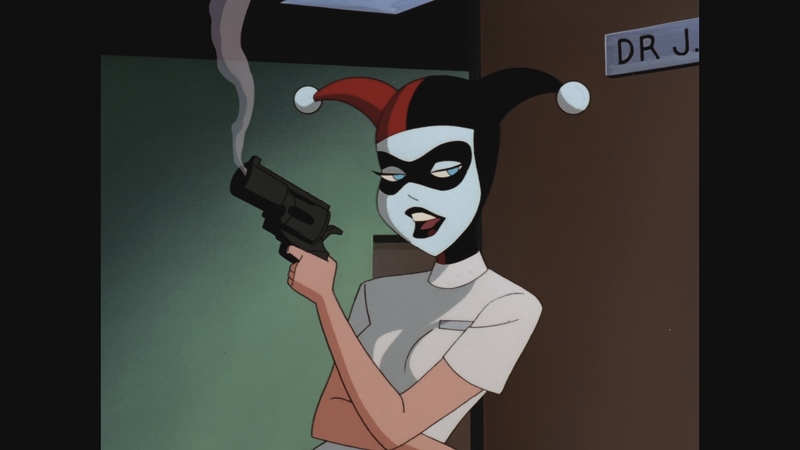 The series introduced the world to Harley Quinn and the popularity of her animated character grew mostly in the 1990s thanks to her striking visual design. The entire television series is spread over ten BD-50s, giving each movie their own separate disc. That is 109 episodes of television. 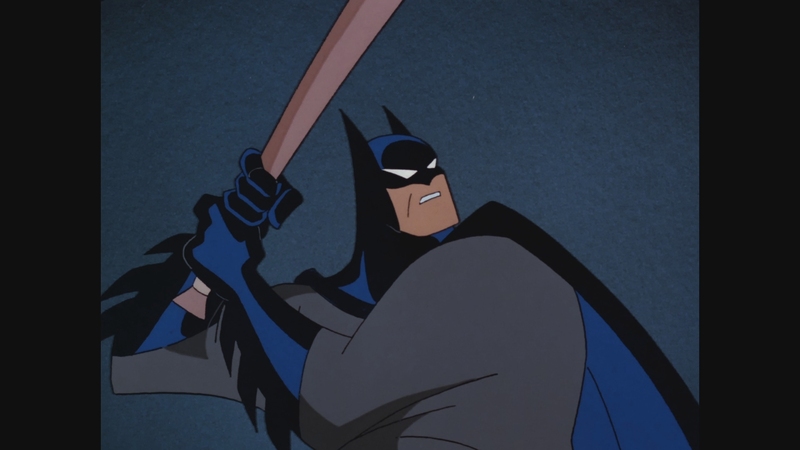 Batman: The Animated Series is shown at its proper 1.33:1 broadcast aspect ratio. The AVC encode is a little disappointing, as the low bitrates lead to faint hints of banding in the occasional scene. It’s not a frequently occurring problem but one that sharp viewers will notice. A few problems in the original animation crop up that viewers will spot. Zooms and other techniques used to direct the episodes lower the visible resolution for small stretches. It’s a tiny percentage of the entire series, but quite noticeable after watching many episodes. Some episodes clearly look better than others. Specks and dust are noticeable once in a while, a natural byproduct of the cel animation. While every episode hasn’t been remastered to perfection like the accompanying animated movies, Batman: The Animated Series largely looks fantastic on Blu-ray. Demanding viewers will be greatly pleased with how the picture quality has turned out. 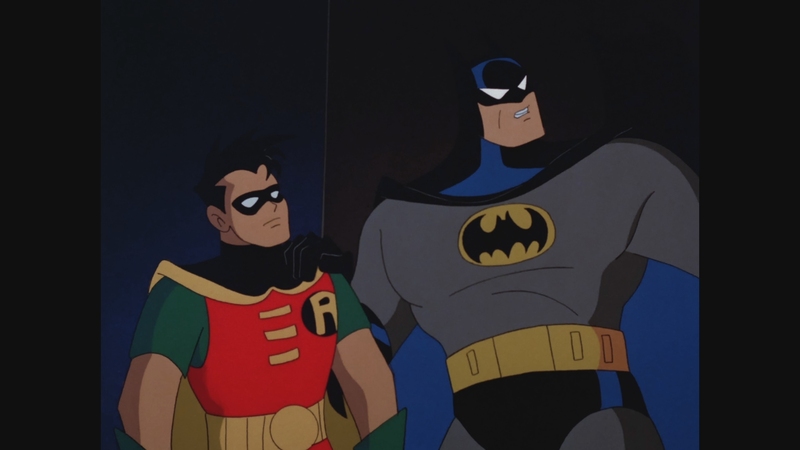 It’s a real treat for fans that have waited years to see animated Batman and Robin tackle their foes in 1080p animated glory. Batman: The Animated Series sounds better than ever in this lossless 2.0 DTS-HD MA soundtrack. Featuring a fairly active stereo sound design by the standards of syndicated animation made for television. Sharp dialogue by such voice actors as Kevin Conroy and Mark Hamill comes through clearly. The powerful opening credits with Danny Elfman’s theme music have been sweetened a bit. The Batmobile’s roar sounds louder here. Long-time fans will likely notice the difference. Composer Shirley Walker’s excellent orchestral score is one of the show’s most prominent recurring attributes. It sounds dynamic with real punch and weight, mixed in perfect balance with the audio design and dialogue. Punches land with real thump and explosions deliver a sonic wallop. There does seem to be a problem with the audio for one particular episode, The Cape and The Cowl Conspiracy. It sounds noticeably worse than the other episodes in terms of depth and imaging. Something went wrong with the audio transfer for the episode. French and Spanish dubs are provided in Dolby Digital 2.0. Optional English SDH and French subtitles play in a white font. While the menu lists Spanish subtitles, they appear to have been left off the discs. What a spectacular set befitting one of animation’s greatest achievements, if you can get a copy in pristine condition. Batman: The Complete Animated Series comes in a deluxe limited edition of 69,000 numbered units. The original plan was for 30,000 units and WB quickly upped that figure when pre-orders sold out. Rumors of a standard edition hint at a cheaper configuration down the road. The Emmy-winning television series couldn’t have been treated any better. It brings over the archival featurettes found on the original DVD set and adds new in-depth documentaries. 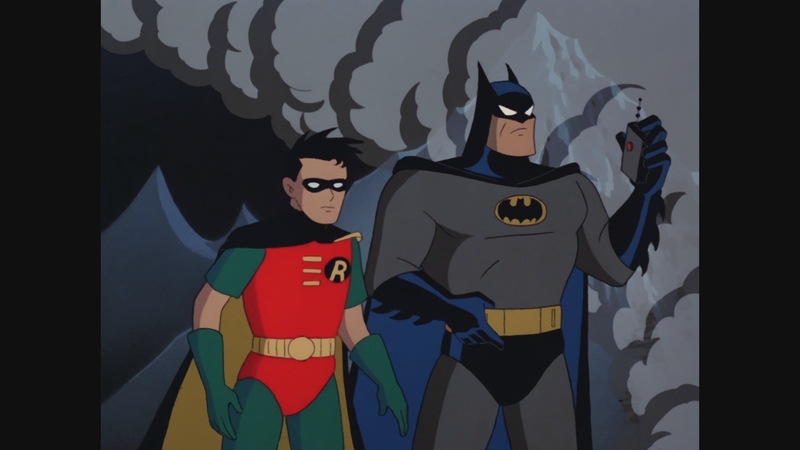 Along with that comes featurettes including the original promo reel for the series hosted by Bruce Timm, spotlights on Batman, Robin and the ensemble of supporting characters, not to mention the voices that bring them to life, and an extensive look behind the scenes of a couple episodes with video commentary and more. A word of caution on the packaging. Given the swift collapse in media at retail, many will order this set from the internet. While the inner case is a beautiful box holding the discs inside a faux hardbound book design, it comes in a flimsy cardboard outer shell that won’t arrive in pristine shape through the mail unless carefully packed. Reports of customers going through multiple deliveries from Amazon to get an undamaged box set are all over social media. The book-like holder isn’t ideal in my mind for Blu-rays but no one can dispute its attractive design and colorful art. It has an episode guide for each disc. Some collectors will be happy with the three included collectible Funko Pocket POPs. Featuring Batman, Joker and Harley Quinn in bite-sized editions. They are the items most likely to be dropped for any future standard edition. The set also comes with seven handsome lenticular collector cards of original animation artwork. Usually I’m not impressed with lithographs but these are striking. They easily could be framed on your wall. The 12-disc set contains every episode of the animated series and copious special features, including all-new documentaries made for this set. Another fantastic highlight is the inclusion of both Batman: Mask of the Phantasm and Batman & Mr. Freeze: SubZero. The two movies were previously released by Warner Archive earlier this year and Warner Home Video ports them over to this set. Many people still consider Batman: Mask of the Phantasm the best Batman movie ever made, receiving an impressive restoration which includes both aspect ratios. A critical bonus feature in the limited edition set is the UltraViolet digital copy redeemable on VUDU. It gives you the entire series in HDX streaming quality, along with Movies Anywhere rights to both movies. Make sure to redeem the digital copy on VUDU to get everything listed. 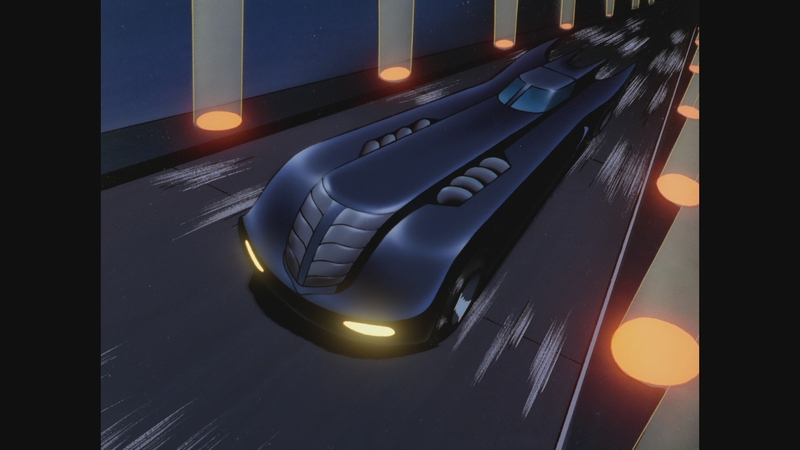 Batman: Mask of the Phantasm (76:27 in HD) – Identical to the previously released Warner Archive Blu-ray, the beloved animated movie looks and sounds fabulous. The restoration and remastering is fantastic, preserving both the theatrical and television presentations. Batman & Mr. Freeze: SubZero (66:35 in HD) – Identical to the previously released Warner Archive Blu-ray, this lesser Batman movie featuring the icy villain and Barbara Gordon remains fun. Audio Commentaries – Twelve episodes include commentaries scattered across the whole set. 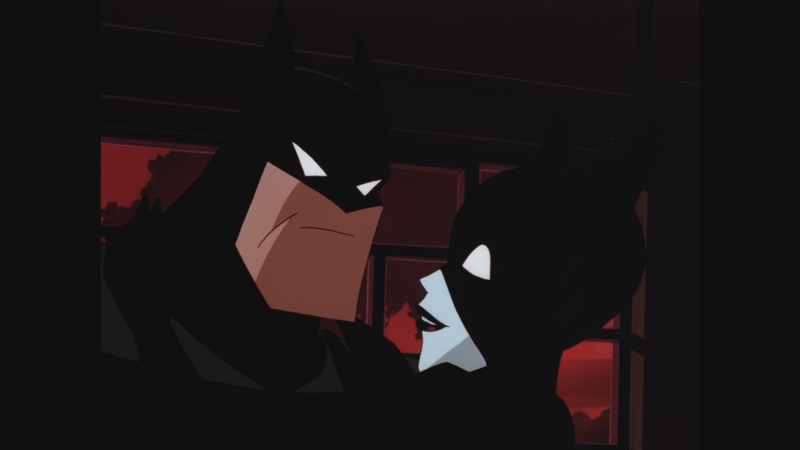 Everyone from Bruce Timm to Paul Dini, and even composer Shirley Walker, discuss working on the series with behind-the-scenes production information. These are fun, lively discussions from the creators breaking their own work down for listeners. It’s quite informative for fans. Episodes with commentaries include On Leather Wings, Heart of Ice, Robin’s Reckoning Part One, Heart of Steel Part Two, Almost Got ‘Im, Harley and Ivy, Read My Lips, Harlequinade, Over The Edge, and others. 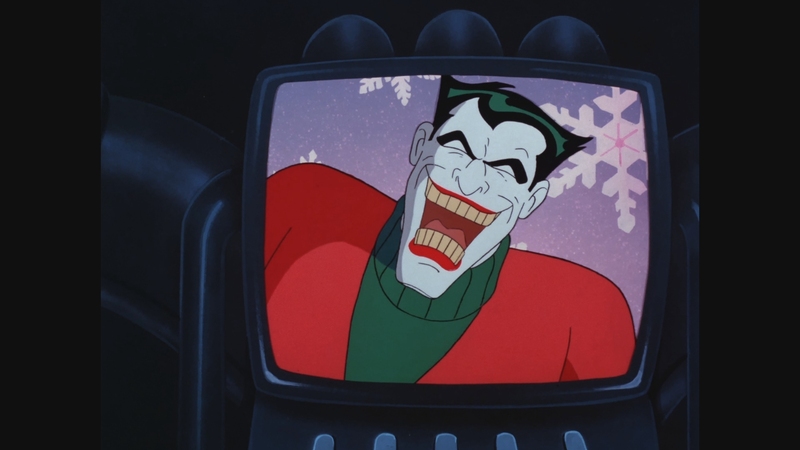 Video Commentary – Producer Bruce Timm, Director Boyd Kirkland, and Writer Paul Dini appear in a video commentary for the episode House & Garden. Heart of Batman Documentary (98:27 in HD) – This all-new retrospective is essential viewing for fans and the primary supplement. Broken up into three parts, it traces Batman from the state of animation back in the 1980s to its eventual development. The retrospective is a comprehensive look at the creation and impact of the seminal television series. It is broken up into three different featurettes below. Full disclosure: This Blu-ray release was provided to us for review by the label. For information on how we handle all review material, please visit our about us page to learn more about DoBlu’s editorial policies. The fan-favorite show remains a masterful adaptation of Batman with engaging characters, memorable voice performances, and stellar writing. The unaltered images below have been taken directly from the actual Blu-ray. For an additional 85 screenshots taken from Batman: The Animated Series, early access to all screens (plus the 18,000+ already in our library) in full resolution, dozens of exclusive 4K UHD reviews and other perks, support us on Patreon.